Google Maps is Google's search engine for locations and directions. Google Maps works well as an exploration tool. You can enter keywords, just like the web search engine, and relevant results will be revealed as markers on a map. You can search for the names of cities, states, landmarks, or even just types of businesses from broad categories, such as 'pizza' or 'horse riding. There are four main types of maps offered within Google Maps. Maps is a standard graphic representation of streets, city names, and landmarks. Satellite is a satellite view woven together from commercial satellite photos. Satellite view doesn't provide any geographic labels, just the raw image. Hybrid is a combination of satellite imagery with an overlay of streets, city names, and landmarks. This is similar to turning on the roads, borders, and populated places labels on Google Earth. Street view offers a panoramic view of the area from street level. Google periodically updates the street view using a car with a special camera attached to the top. Not every area has enough detailed information to zoom closely in Satellite or Hybrid view. When this happens, Google displays a message that asks you to zoom out. It would be nice if it either did this automatically or switched to Maps view. Google Maps also provides an overlay of traffic information in select US cities. The roads will be green, yellow, or red, depending on the level of congestion reported. There is no detailed information telling you why an area is congested, but when you navigate, Google will generally tell you an estimate of how long you will be delayed. It's extremely helpful for someone trying to drive somewhere for the first time. It's also very cool for the "Internet tourist," who likes to view famous locations on the Web. Manipulating maps within Google Maps is similar to the way you'd manipulate maps within Google Earth. Click and drag the map to move it, double-click on a point to center that point and zoom in closer. Double right-click on the map to zoom out. If you prefer, you can also navigate with the zoom and arrow buttons on the upper left corner of the map. There's also a small overview window on the bottom right corner of the map, and you can use your keyboard arrow buttons to navigate as well. I tested this feature with driving directions to the zoo because I knew the shortest route involved a toll road. Google Maps warned me that my route included a partial toll road, and when I clicked on that step in the driving directions, it pointed to the exact spot on the map, and I was able to drag the route to the slightly longer road that avoided tolls. Google Maps lets you drag and drop driving directions for any route to customize your travel. You can also view traffic data while you do this, so you can plan a route over less busy streets. If you happen to know a road is under construction, you can also easily drag your route to avoid this. The printable instructions are updated with your new route, along with updated distance and driving time estimates. This feature is extremely powerful, and sometimes a little difficult to use. It's easy to accidentally drag the new route to back over itself or drive in loops. If you make a mistake, you need to use the back arrow on your browser to undo it, which may not be intuitive for some users. In spite of the occasional glitch, this is probably one of the best new features to ever happen to Internet driving directions. Google Maps is the best choice for exploring. Yahoo! Maps and MapQuest are both very useful for finding specific driving directions to and from a known address. However, both require that you enter an address or search path before you see a map and both have interfaces with a lot of extra visual distraction. Google Maps opens with a map of the U.S. unless you've saved your default location. You can start by searching for keywords, or just explore. 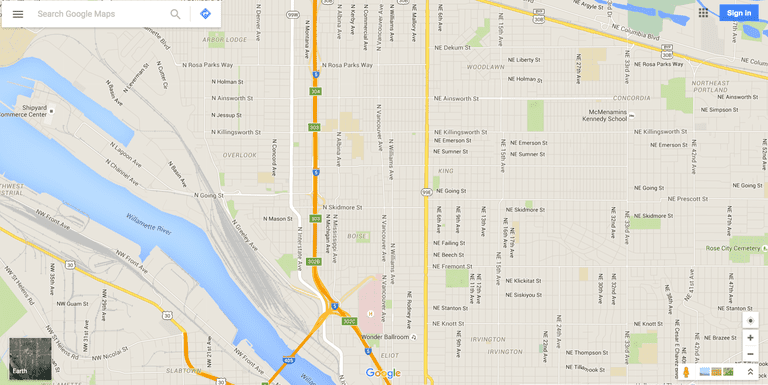 The simple, uncluttered Google interface is also a strong point for Google Maps. Google allows third-party developers to use the Google Maps interface and customize it with their own content. These are called Google Maps mashups. Mashups include sightseeing tours with movies and audio files, social location services like FourSquare and Gowalla, and even Google’s own Summer of Green. You can also create your own content overlays and either publicly publish them or share them with select friends. Creating a custom map could be a way to give driving directions to a hard to reach the house or add additional information to a commercial building's campus. When we originally reviewed Google Maps, we said that it would be fantastic if only they'd include some way to plan alternate routes. It seems our wish has been granted and then some. Google Maps has a great, clean interface, and mash-ups are a lot of fun. It's easy to switch from a Google search to find a store or location in Google Maps. Google Street View is sometimes creepy but always fascinating, and the ability to easily plot alternate routes turns Google Maps into a home run.